Can I still do the butter in the turkey if I brine it for 12 hours? Good question! I have never brined a turkey, so I did a little research. This recipe (http://www.williams-sonoma.com/recipe/brined-turkey-with-herb-butter.html) uses butter on a brined turkey, but only one stick. In my opinion, go ahead with the butter, but maybe cut down on the amount. I think you still need the butter on the skin to get it nice and crispy. Let me know how your bird turned out! It came out AMAZING. doing it again tomorrow!! Haha! Also, do I wait to do the gravy after it’s been. Resting for a while? Or do I start the gravy right away and just reheat it on the stove before serving? Thanks! I’m glad to hear your turkey came out great! As for the gravy, I never have time to wait for the turkey to rest before I make the gravy. LOL! You can start the gravy right away and reheat it with no problem. I even save the gravy and microwave it the next day. Good luck tomorrow! Yeah that’s what I was thinking! Also, for the lemon when butter, that could be made ahead of time correct? Like tonight for instance and just get it to room temperature before hand? Anything to save some time haha. I’m prepping the turkey for tomorrow as we speak! It will definitely save time. Thanks for such a detailed post with pictures! This recipe was outstanding! I have made many a turkey every Thanksgiving and everyone agreed that this was the best. The gravy was not your typical turkey gravy and I wondered if it’s a British thing? It was delicious, but seemed liked it belonged over pot roast or something more beefy (I didn’t bother with the walnuts). It was dark and on the thin side, since there was no flour in the recipe. I made a cornstarch slurry to thicken it up a bit. It had very complex flavors, which if you look at the list of ingredients, it makes sense. I served a Costco turkey gravy along with the Ramsey gravy and people enjoyed comparing and contrasting the two. The prep work for this turkey takes much longer than 30 minutes, but it’s worth it. I prepped the turkey the day before and was very glad I did. Much less stressful. One last tip – I cooked the turkey early in the day, carved it, placed it in a pan, poured turkey stock over it to keep it moist, covered with parchment paper and foil and then kept it in my oven warmer until dinner (about 3 hours). Amazingly moist and flavorful. This is now my go-to turkey recipe! How many people did this bird feed? Did you buy the recommended 5.5kg bird? I have used this recipe with the 5.5kg/12lb bird and up to 6.8kg/18lb. I think you can feed up to 10 people comfortably with a 5.5kg/12lb turkey. I\ve been looking at Gordon’s clip on youtube and various transcriptions invluding this one to answer one question. When the bird comes out of the oven, there is alot of juice. Gordon calls this excess fat and pours it into a bowl. Is this waste? Nowhere do I find it’s supposed to be poured back into the gravy or reused for anything else. i use it to make traditional gravy alongside the cider gravy for the diehard traditionalists at my thanksgiving. It’s basically the butter and excess fat. I once added it to the gravy – big mistake! 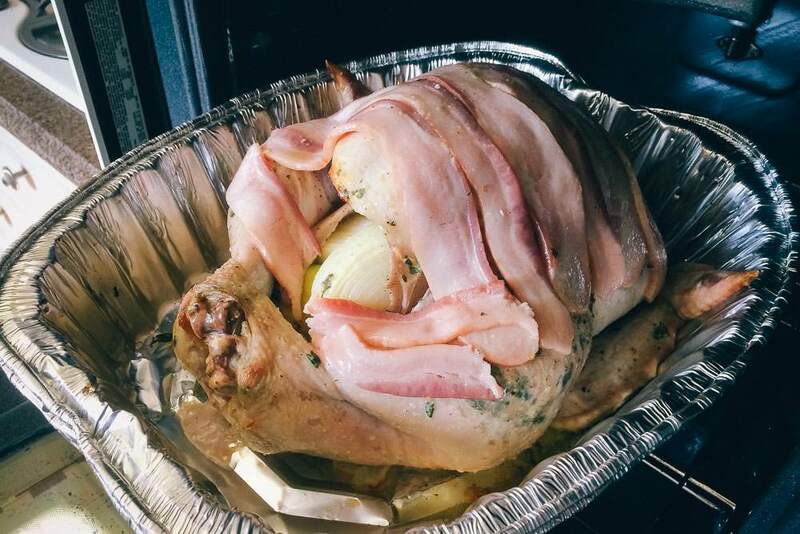 Can I leave some bacon on the turkey??? I don’t see why not. You will need some of the bacon if you’re making the gravy. After seeing this on tv in turkey today . It’s roll on Xmas , got to try this , sounds lovely and do not look to hard todo . Hope it all goes to plan . With Brussels sprouts , can I use fresh chestnuts ?? Hi, I noticed that you have adjusted the recipe a little, e.g. bulb of garlic in the cavity, extra tomato in the gravy, etc. Is this because you have found better results? I do get better results with this recipe. I have recently cut back on the number of tomatoes by one or two. I’m a little more loose when it comes to the gravy. What kind of hard cider do you use in the gravy recipe? I like to use something that is not too sweet. In the past, I have used Angry Orchard Crisp Apple or Angry Orchard Stone Dry. How much cider do you use ? Since I don’t have a big enough pan, I cut my liquids by about half. I use about 12 oz. of chicken stock and almost a bottle of cider (10-12 oz.). I play it loose with the gravy recipe. Can I use turkey bacon instead? After the skin has browned in the first 30 minutes, it protects the skin from burning. The fat from the bacon keeps the turkey breast meat moist, but the butter does as well. You can use the bacon afterward for the gravy. 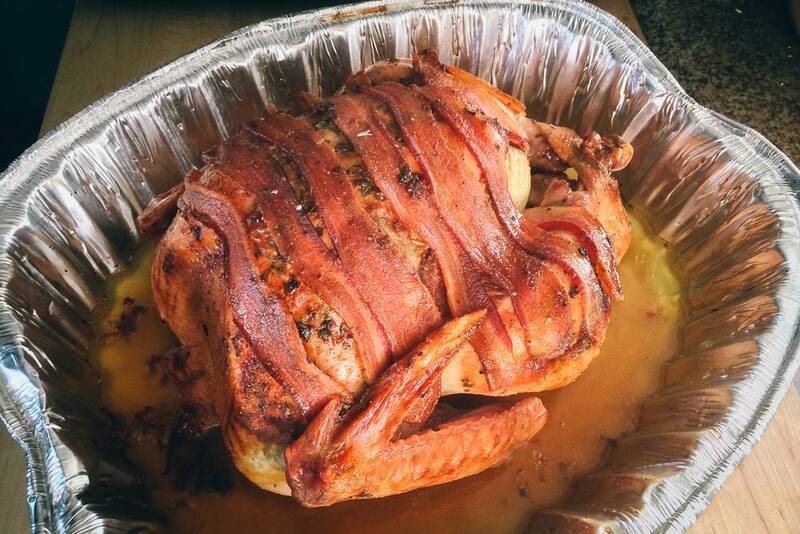 I believe the most important function for the bacon is to keep the skin from burning, so turkey bacon should be fine. Personally, I use pork bacon for the fat to give a nice flavor to the skin and the gravy. 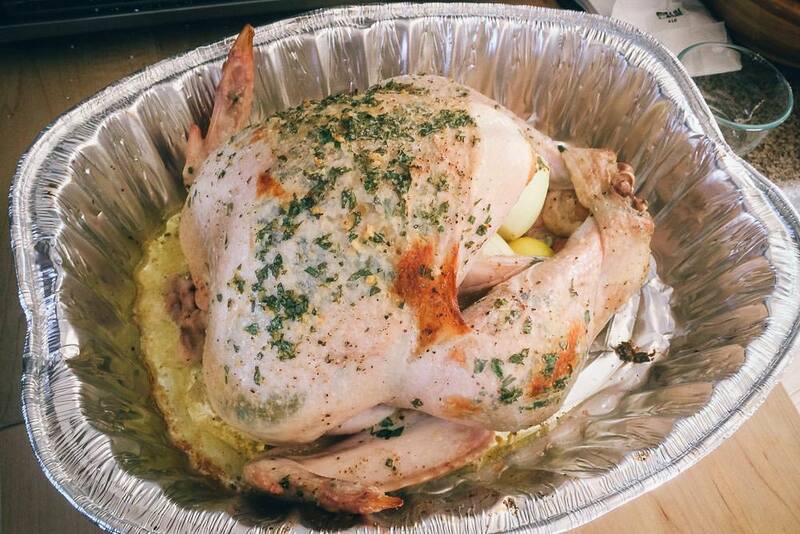 What brand hard cider do you use when making this turkey? Also this will be my very first turkey do you have any advice? The best advice I can give is time. Give yourself plenty of time for prepping and making the gravy! Prep the bird the night before and use the extra time for the gravy. Do you have to rinse and dry the turkey before seasoning? Also, what do you do with the giblets? Just toss them? Yes, I rinse and dry the turkey. As for the giblets, I cook some of them up and feed it to my dog. Hi! For the lemon, parsley and garlic butter, do you use salted or unsalted butter? I use unsalted butter. I add salt separately to control how much salt goes into my food. It’s my first time cooking turkey and I really hope it’s successful! I used a completely different recipe from a different chef’s recipe and the results were a horrible Thanksgiving turkey. I just came across this recipe today , and I’m going to make this recipe tomorrow. Could you please tell me exactly how many tablespoons of sea salt do i need to salt the turkey initially AND much sea salt do I use in the butter preparation ? Confession time… I don’t measure how much sea salt I use. I generally use very little. Sea salt is more potent than regular salt, so I would use about 1/4 teaspoon or less in the butter. Use about 1/2 teaspoon for the cavity. I personally prefer yellow onions, but you can’t go wrong with white onions. Yellow onions are an all-purpose onion where as white onions have a stronger flavor. How about the rest of the fat juice that I drain off? Throw it? I use a little of the fat juice in my bread stuffing to give it more flavor. I toss the rest. I take the butter and turkey juices and let them separate (fat will rise to the top). I baste/spoon off the fat and use the juice to make gravy. This juice can be used in place of the chicken stock in any gravy recipe. Both the fat and juice can be used. What I like about this recipe is the tip to let the turkey rest as long as it has cooked. It avoids the stress of whether the turkey will be done too early and dry out, or not be done in time for Thanksgiving dinner. I get up early, roast the turkey according to the recipe. When it is done I triple wrap it in foil and put it in a portable cooler with a kitchen towel on top and underneath. It can rest and remain extremely hot for up to four hours and letting the juices reabsorb makes it very tender and juicy. It takes all the guess work out of trying to time the cooking of the turkey with the planned dinner time since the turkey is cooked way before I start preparing the other dishes. I use unsalted butter because I want to control the amount of salt. I have high blood pressure and I gotta watch the salt intake. The garlic in the turkey cavity is used for the gravy after the turkey is cooked. I haven’t used corn starch in the gravy. If you do use corn starch, please comment back and tell me how it turned out! Hello, I will be making this turkey this week I’ll like to know if I can use hickory smoked bacon to cover the turkey? & If I don’t have any fresh parsley can I use dried? The hickory smoked bacon should be fine. I’ve used applewood bacon with good results. I think the dried parsley will be okay as well. First time ever cooking a turkey and i wanna try this and the turkey I have is 19.46 what is the time for cooking and rest? Young cook in a bind help! If your turkey is 19.46 lbs., then cook at 350º F for about 4 to 4 1/4 hours. It is important to let the turkey rest for as long as you cooked it (4 hours). This will allow the juices to be reabsorbed into the bird. Give yourself plenty of time to cook the turkey (you can prep the bird the night before). And remember, you got this!